Sand painting is a faux finish technique that was not uncommon for exteriors of masonry buildings in the early part of the twentieth century. By dusting sand onto paint while still tacky, painted wood or metal details were made to resemble stone. If you guessed you were looking at magnified grains of sand in the teaser photograph above, you were right. The photograph, taken through a binocular microscope, is actually of a sand paint sample taken from the Senator Lougheed Residence in Calgary. Sand painted wood details at the Senator Lougheed Residence, Calgary. The Municipal District of Peace No. 135, which has been celebrating its centenary in 2016, hosted the unveiling of the two latest Provincial Heritage Markers on August 24. The first marker details the rich history of the region’s fur trade and the competition between the Hudson’s Bay Company and the North West Company, as well as the crucial participation of First Nations people as trappers and provisioners. The second marker highlights the history and growth of agricultural settlement in the area at Shaftesbury Settlement. 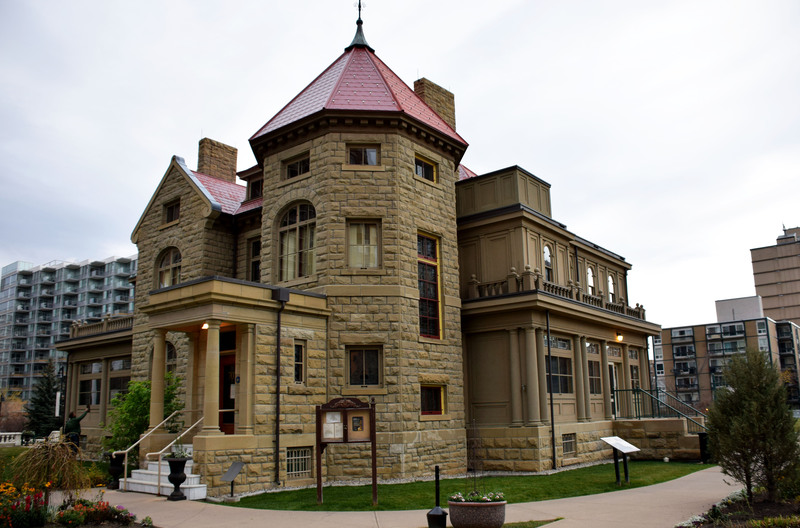 The unveiling was attended by Leah Miller, Board Member of the Alberta Historical Resources Foundation, who brought greetings from the Board and Minister of Culture and Tourism, Ricardo Miranda. 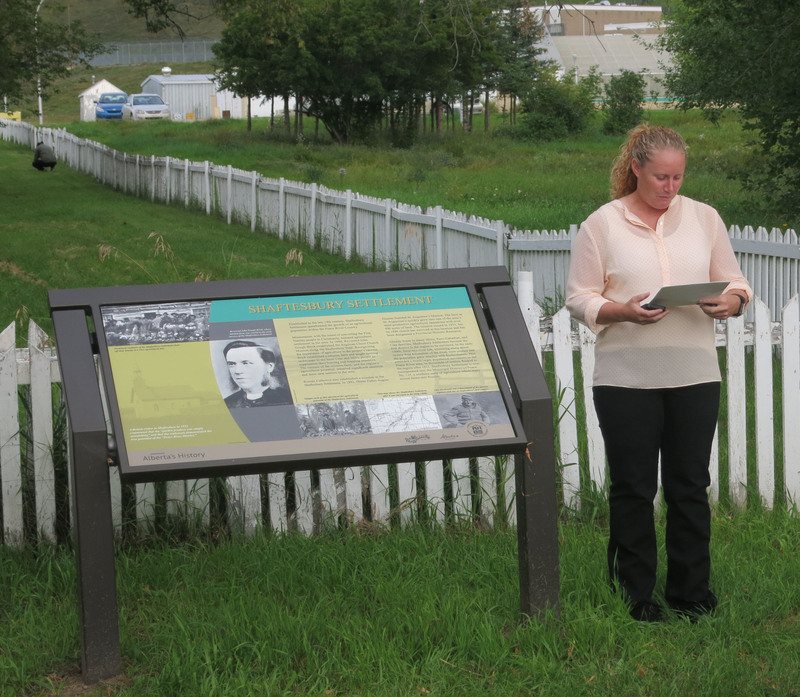 Leah Miller, Board Member of the Alberta Historical Resources Foundation, at the unveiling of the Shaftesbury Settlement Heritage Marker. The Shaftesbury Settlement marker was installed at the St. Augustine’s Mission Site in September 2015, while the Peace River Fur Trade marker was installed at the site of the McLeod’s Fort Cairn on Highway 684 in December 2015. The Provincial Heritage Marker Program promotes greater awareness of the provincially-significant people, places, events and themes that have defined the history and character of our province. The public plays an important role in the program, and we welcome applications from groups or individuals who want to propose topics and locations for future markers, including our popular urban/trail-sized markers, suitable for placement in towns, parks, and other locations with pedestrian traffic. For more information about the program, please visit our website. New Peace River Fur Trade Heritage Marker at the site of McLeod’s Fort Cairn on Highway 684 in the Municipal District of Peace No. 135. A few weeks ago we featured ice patch archaeology in Willmore Wilderness Park as part of the Rocky Mountain Alpine Project. The trip to Willmore was one of two attempts this summer to find archaeological artifacts and other organics melting out of Alberta’s ice patches. The second attempt took place from August 22-26, this time in Jasper National Park and, as promised, here are the results! For a background on the Rocky Mountain Alpine Project, check out our video. This year was our second visit to Jasper’s ice patches. 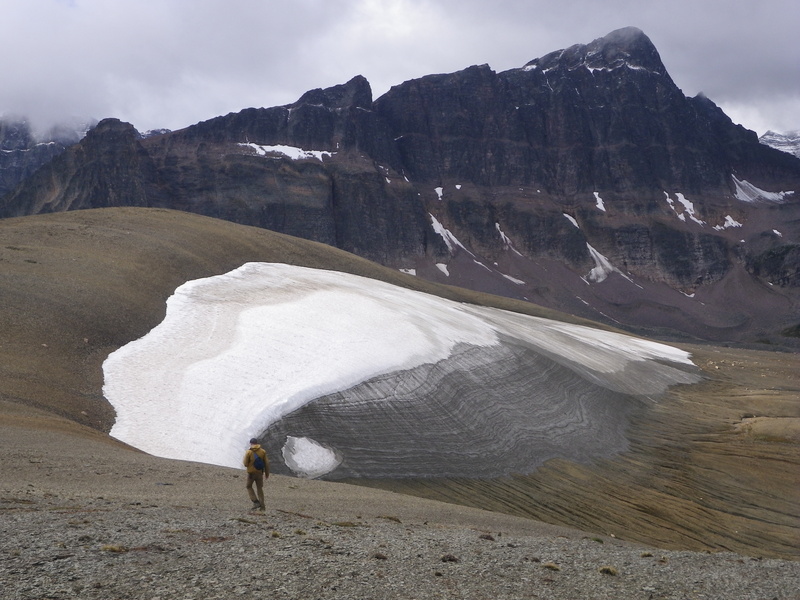 The goal of last year’s trip to Jasper was to determine if there was potential for finding organics and archaeological artifacts in Alberta’s alpine ice features. The trip was very successful and we found that many organics, like antlers and wood, were preserved at high altitudes. We also found a cultural piece of leather, with two knots in it, melting out of one of the patches. It was radiocarbon dated to A.D. 1640. The exploratory trip proved to be successful and we were excited to return to Jasper this year, both to re-visit the ice patch that yielded the leather and to explore some new areas. ‘Marilyn Monroe Nearly Drowned,’ read the headline, tucked away in the entertainment pages of the Calgary Herald for August 14th, 1953. Monroe was on location in Jasper National Park for the filming of the 20th Century Fox blockbuster western, River of No Return, when she slipped and fell in the icy waters of the Maligne River. Although pulled to safety by her co-star Robert Mitchum – and a dozen other crew members who quickly rushed to her rescue – she suffered a badly sprained ankle.